Alfredo Ayala, of McAllen Rowe, is hugged by McAllen ISD Athletic Director Paula Gonzalez, after winning the Tom Landry Award of Excellence during the All Valley Sports awards banquet held at Mario's Banquet and Conference Center June 10, 2017 in Mission. MISSION – When Alfredo Ayala heard his named called as the winner of the Tom Landry Award of Excellence at the 2017 All-Valley Sports Awards Banquet, he walked onto the stage trying his best to suspend shock and joy before hundreds of applauding guests. Shock because of his past, and joy because of where he found himself on Saturday night. Ayala spent most of his life in a single-parent household after his father left the family. His grandmother took his mom and siblings in after the family had nowhere to go. His grandmother was diagnosed with cancer, and her death was the hardest day of his life. Ayala vowed her memory would not be in vain. “I made a promise to live my life the way she did: full of optimism and positivity,” Ayala said. 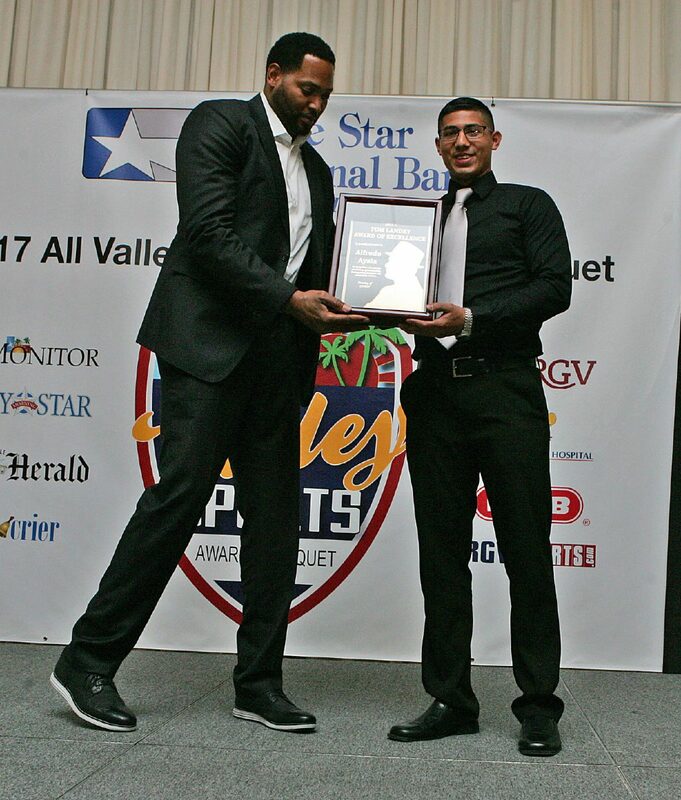 Alfredo Ayala, of McAllen Rowe, is presented the Tom Landry Award of Excellence by Robert Horry during the All Valley Sports awards banquet held at Mario's Banquet and Conference Center June 10, 2017 in Mission. 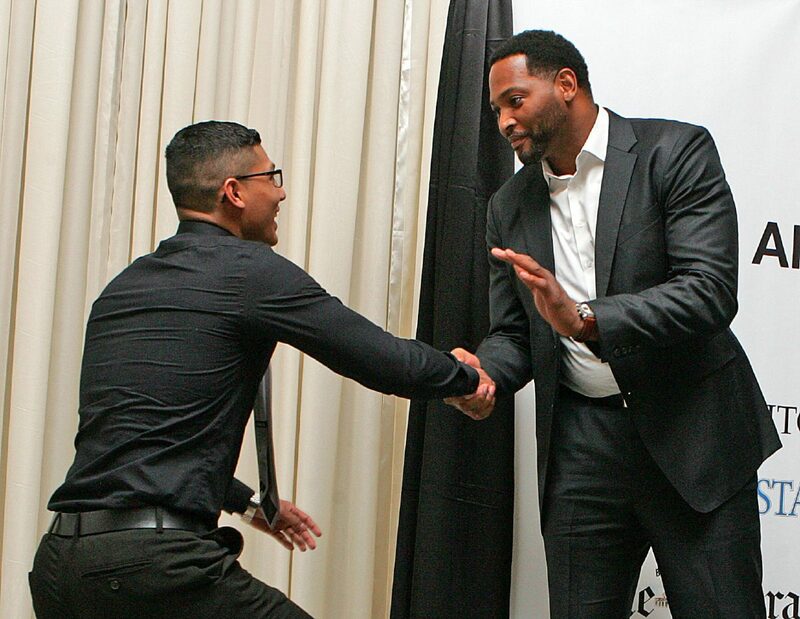 Alfredo Ayala, of McAllen Rowe, is congratulated by Robert Horry after winning the Tom Landry Award of Excellence during the All Valley Sports awards banquet held at Mario's Banquet and Conference Center June 10, 2017 in Mission. When Ayala was old enough to work, he began picking up shifts at McDonald’s to help his mom make ends meet. Through it all, Ayala participated in 10 school-related activities and competed in athletics. Ayala was an accomplished basketball player for McAllen Rowe. He had been named a starter and captain during his sophomore campaign and was one of the fiercest defensive players in District 30-6A. A weightlifting session before his senior year would change the trajectory of his future. During his senior year, Ayala primarily played tight end, catching 12 passes for 219 yards and three touchdowns. He also played middle linebacker some, as well. Ayala was a first team all-district selection at a tight end. Off the field, Ayala finished with a 4.0 grade point average, good for the 12th highest average in Rowe’s 2017 graduating class of 448 students. Ayala’s grades were impressive enough for Wabash College in Indiana to award him with a full academic scholarship. He will also play college football at Wabash. Ayala was also endowed with a $3,000 check by virtue of winning the Tom Landry Award of Excellence. The award will always hold special meaning to Ayala.